Ages 4 and up. This book includes reproducible pictures, game boards, and worksheets for teaching speech sounds and remediating phonological processes. Pictures are included for teaching /b/, /ch/, /d/, /f/, /g/, /k/, /l/, /m/, /n/,/p/, /r/, /rr/, /s/, /t/ and other sounds in Spanish words. Pictures of nouns containing each sound are arranged by the word position in which the sound occurs. Most Spanish consonants occur only in the initial and medial position of words. The only Spanish consonants that occur in word final position are d, l, n, r, and s.
Target words familiar to young children are emphasized. 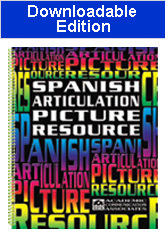 This practical book is great for use at school or at home with Spanish-speaking students who have articulation disorders. No shipping and handling charges are applied to this item.